Being odd is being cool. At least if you as a grownup man walk around with one of these in your PDA. 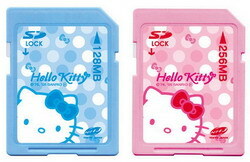 Available in pink and blue and 128 and 256Mb. Now this is just something you must have – if you have a dog. 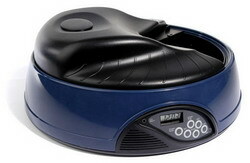 It’s the intelligent programmable pet dish, and it has four compartments on a rotating dish that you can fill with food and then program the little thing to rotate when it’s time for food. Straight up, this is the coolest thing I have ever seen (you mean this week, right? – Ed!). This bad boy is gonna get you some lovin like you wouldn’t believe! 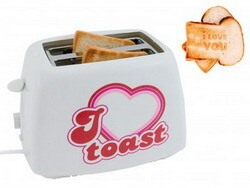 The Love Toaster ($78) toasts the message ‘I Love You’ onto every round of freshly toasted bread, thanks to a special metal plate inside the unit. Like it matters, but you also get a removable bread crumb tray, variable browning control, and cool touch walls. Don’t say it with flowers – say it with toast. And tell her that Chopper sent ya! Yeah, man. If you’re anything like me then this is something you must try. 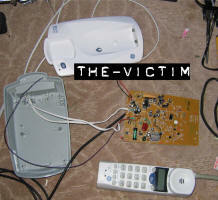 It’s an experiment to create an plasmoid in your microwave oven using things you’ll be able to find in your home. If you like flashy sites with a lot of bling-bling, and you like space things, then you should have a look at NASA’s interactive show about their space shuttle program. Jonathan Archer (!) is the presentor! !